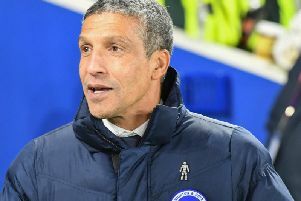 Brighton suffered a disappointing 3-1 Premier League defeat at home to Burnley this evening. Here's how we rated the players of both teams. Chris Wood scored a brace for the Clarets, before Ashley Barnes made it 3-0. Shane Duffy got Albion's consolation 14 minutes from time. Tough evening for the right-back, who wasn't as effective going forward from right-back. Lively down the right. Header pushed over by Heaton in early exchanges and also saw a fierce strike save by the Burnley keeper. Picked up a knock and subbed early in the second half. Burnley's centre-backs marshalled Albion's top-scorer well. Headed Gross cross wide at the near post late in the first half.